In the interest of curbing hunting related accidents, hunter safety classes were developed and in the late 1940’s New York State became the first state to pass a law requiring hunter safety training. Other states developed similar programs of their own, some voluntary and others mandatory. During the 1970’s the scope of hunter safety was broadened to include a variety of aspects besides safety such as hunter ethics/responsibility, wildlife identification, and conservation. Today the course is known as hunter education. Hawaii’s program began in 1978 as a voluntary course. On July 1, 1990, the hunter education course was made mandatory by statute for persons born after December 31, 1971, or those born before that date but have no proof of having hunted in Hawaii. Hunter education is offered in each state, Canadian province, and parts of Mexico. Since it’s implementation, there has been a tremendous decline in hunting related accidents across the country. Some of the volunteers hunt while others do not. What they have in common is their love for the outdoors and a desire to instill values about outdoor responsibility, conservation, and safety. To be a part of this truly dedicated and committed group of people is to be a member of a very positive and influential family. Hunting in Hawaii requires a hunting license whether you hunt on public or private land. a Hawaii Hunter Education Wallet Card; or a Letter of Exemption. 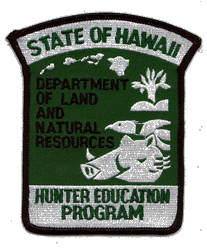 Hawaii Hunter Education Wallet Cards are issued to graduates of our basic Hunter Education course and you may use it to purchase a Hawaii Hunting License directly from a license agent at various retail locations throughout the state. You may also purchase your Hawaii Hunting License online. If you’re a nonresident without a hunter education card, contact your local hunter education office and find out how, when, and where to enroll in a hunter education course in your home state/province. Once you get your hunter education certificate, you need to fill out and mail in a completed Letter of Exemption form to our office. Once your form is processed and validated you will be able to purchase a Hawaii hunting license. If you are a non-immigrant alien and wish to temporarily import firearms and ammunition into the United States, please read this notice by the Federal Bureau of Alcohol, Tobacco and Firearms. Unfortunately, many hunters don’t plan or research their hunting trips before traveling to Hawaii and are turned away at the license agent’s counter because they were unaware of this license requirement. As always, with any hunting trip, know before you go!